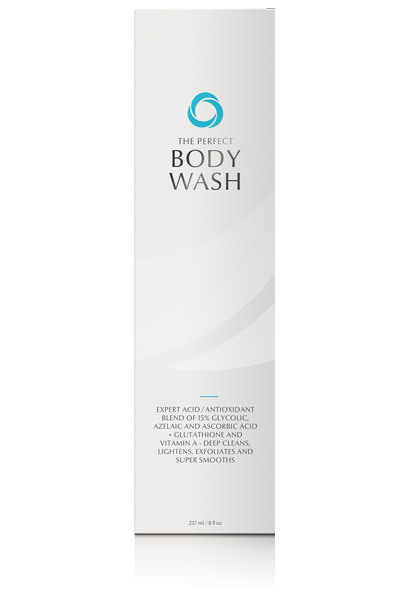 With 15% Glycolic acid The Perfect Body Wash deep cleans and exfoliates the skin, azelaic acid brightens and reduces irritation. This product also features the master antioxidant glutathione. Cools and soothes, promotes healing of inflamed lesions such as acne and rosacea. Reduces skin inflammation, brightens skin, helps to kill the bacteria that cause acne and rosacea. A powerful anti-aging antioxidant that lightens skin, detoxifies and protects cells from free radical damage. Improves elasticity, enhances skin barrier function, helps erase discolourations, revives tone and texture, mitigates acne and red marks. Hydrates, reduces itching and inflammation, promotes healing. Apply a small amount to damp skin, work into a lather then rinse. You may experience a slight tingling sensation. For external use only. Avoid direct contact with eyes. Should this occur, rinse immediately with water. Do not apply to irritated skin. Limit exposure to sunlight, AHA acids increase sensitivity to the sun. Always use Mineral Perfection SPF. The Perfect Skincare is available to purchase online through our exclusive partner – Effortless Skin. Doctor, Dentist or Registered Nurse? Fill in our registration form and you’ll be given a username and password to access professional resources, training information and to purchase.